Interests - Dr Who, Lord of The Rings, PS2, Arts and crafts, Computer games â€“ empire building, History, Cooking, and Puzzle Books. Nathan and his brothers were diagnosed with X-linked Lymphoproliferative Syndrome (XLP) back in November 2003 after suffering from acute anaemia. 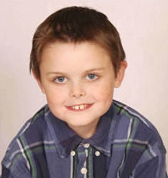 The only cure is a bone marrow transplant which Nathan is due to have in 2005. Nathan will then be the 3rd of the brothers to go through this – and he potentially could become the piggy back donor for Luke – the youngest of the brothers. Nathan had lymphoma cancer when he was just 3 and was not expected to pull through but miraculously did and only spent one night in intensive care. It was this episode that first alerted the doctors to the serious problem that we subsequently found out that all 4 boys suffer from – although it took us almost 7 years to get there. Nathan is the peace maker in the house. Although small for his age he definitely holds his own both at school and home – and he is a real charmer and future lady killer. He has an excellent sense of humour, but is also very determined which we believe is born out of his experiences of life. We are confident that he will end up on the stage one day. We sat down last night over tea and talked about the wonderful support we have had from you guys over the last 4 years. There was agreement that as Joshua, Nathan and Daniel are so well now that they should move on to the ‘Moved On’ status. It would be good to keep Luke on for a few more months – he remains well but still a good way to go. Tomorrow Nathan will travel up to Great Ormond Street Hospital in London with me and on Wednesday morning he will donate some of his own bone marrow to save the life of his brother. About 10 days ago we took Nathan and Luke up to GOSH for a standard day of tests as Luke is due his BMT in 2 or 3 weeks time and Nathan is his donor. This Sunday should be a wonderful day (all of the Hartleys will be there) as we have the first XLP RT Triathlon. We have 27 teams battling it out over a 3.5 mile run, 16 mile cycle ride and a 0.5 mile swim! Luke is now booked in for his bone marrow transplant in the middle of March. The big news however is that Nathan will be his donor. The good folks at Great Ormond Street Hospital learnt last week that the donor we were expecting to use is now no longer available – we know no more than this. The consultants at GOSH are ‘not worried’ by this and have already carried out a number of ‘piggy back’ BMT’s. Nathan is delighted that he will have the chance to save the life of his brother! Please continue to pray that the boys stay well as we approach this last hurdle. Nathan came home from his BMT literally a year and a day ago. He had a few days in Southampton General in January for a small infection and has now flown through his recovery – wonderful. He has settled back into the hustle and bustle of school and became a teenager yesterday in Lapland – indeed it was Nathan’s wish to go there. He had his throat stretched around summer time and this has made a huge difference to his ability to eat – he has since put weight on and meals are not the battle they used to be. He is still small for his age and so next year we will look for further medical help if we do not see him grow. Indeed with things being relatively ‘normal’ in the Hartley household we have also enjoyed a memorable trip to Disneyland Paris and a week on a farm in beautiful Devon and Dave took Joshua and Nathan camping at ‘Soul Survivor’. I took Nathan up to GOSH last Sunday night and had the strange experience of staying on Fox Ward for a night – the ward where three of the boys have successfully gone through their bone marrow transplants. It was strange seeing the nursing staff and seeing the anxiety etched onto the faces of the parents there. Nathan was up to have his oesophagus stretched. For those of you who know Nathan, you will know that he over chews everything and takes an age to swallow. With recent visits to GOSH it became clear that he has a narrowing in his oesophagus and so in he went to get it ‘stretched’. For a young man of his size the size of the opening should be between 16 and 18mm. Nathan’s was only 5mm. The good news is that the ‘stretch’ was successful and it is now up at 16mm – and it was an easy stretch. He already claims to be finding it easier to swallow although his throat is a little sore following the procedure. Otherwise he remains well and we had the good news at the tail end of last week that he can now start his childhood immunizations again – the sure sign that they consider him to be successfully transplanted and engrafted. Thanks for those of you who have sponsored Nathan and Daniel on their ‘celebration of finishing their bone marrow transplant walk’ they are now 10% of the way to their self imposed target. Nathan is also doing well. He is now off the overnight special milk feed, which is a relief to us all, and his weight is staying stable. Importantly for Nathan he now has grown 2cm since transplant – great news. The most recent bloods taken from him do show that he has a relatively high load of EBV (the glandular fever virus – which for XLP boys pre transplant is often life taking) so the hospital will continue to monitor this. Nathan continues to get better and better. Now surviving full days at school and loving it! He is now just on a few medicines although still on the overnight milk feed. Thanks for your continued support and prayers. The news that we wanted – Nathan can return to school on Tuesday! His immune system has recovered sufficiently that the Dr’s from Great Ormond Street Hospital are happy for him to return. This is really the landmark event that shows that he is now well recovered from his bone marrow transplant. Whilst it will still probably take another 18 months for his immune system to completely catch up it can now successfully defend him against most viruses. Indeed you may recall that Nathan has EBV (the glandular fever virus – this is the deadly virus for boys with XLP) well his ‘load’ has fallen from 17,000 to 6,000. Nathan started a new school last summer and was only there for 2 weeks before going up to GOSH for his transplant. However he is really looking forward to getting back and into the swing of school life. Nathan continues to do well. He is still not eating great but is now the heaviest he has ever been. His immunity is coming back strong and hope is that he will be able to return to school after Easter. This is a much faster return than either Joshua or Daniel, but primarily because he did not need to have his t-cells knocked out as he did not have EBV (the glandular fever virus – XLP boys have no immunity to this disease – for them without a transplant it is a potential life taker). Interestingly he does now have EBV, but his new immune system is holding it at low levels, and no one from the hospital seems concerned. We’ve just got back with Nathan from a trip to clinic at Great Ormond Street Hospital. Overall they are pleased with Nathan’s progress. Due to kidney damage (which are slowly repairing themselves) Nathan is currently not on a key medicine called Aciclovir – which amongst other things protects from herpes virus. This is a concern at the moment as his mouth has some nasty ulcers and we know the damage this can lead to. But otherwise good – his blood results are now all in the ‘normal range’ (HB, platelets, white cell count) and he remains well in himself. Last week we feared that he had liver GVHD (Graft vs. Host Disease) coming on – but no – just the kidneys demanding to be rested. Nathan is well in himself and has actually grown 2cm’s since the start of transplant. This is great news for Nathan, we had been told that it would be unlikely that he would start growing again until a year after transplant – we are 8 months ahead of this! As Nathan is very small for his age this is wonderful news! And for those in the UK please don’t forget to watch Songs of Praise this Sunday (BBC1 – 18:10 GMT) – it should be interesting! Nathan continues to do well. His ‘bloods’ are all moving in the right direction. He still has some sickness and is heavily reliant on a milk feed to get the necessary calories in. He is still struggling to eat (Nathan has a narrow oesophagus meaning that he has to chew and chew). But he is getting on fabulously with his home tutor – a great blessing and otherwise remains well. This Thursday it will be the first historic milestone – 100 days post transplant. Nathan returned home from his bone marrow transplant on his birthday on the 15th December – it was a long but quite wonderful day. He has now been home for a whole 2 weeks and remains very well. He is on an overnight feed which makes our night times somewhat disturbed and interesting. Aside from his seizure and the damage to his kidneys (!?!) the transplant went well. Nathan remains the great charmer, full of beans and always happy to laugh. His hair is also starting to come back. It has been wonderful having Nathan back home. He has settled right back in and is enjoying good home cooking again – although is on a regular overnight feed. He is doing well and the GVHD rash has now all but disappeared. Can I take this opportunity, a week before Christmas Day, to wish you all a peaceful Christmas. We are so grateful for the wonderful support over the last few months – it means so much! Nathan is home – hallelujah! I spoke to Allison at GOSH late afternoon. Nathan is doing so well that they are looking to let him come home next Thursday – 15th. This is wonderful news and well in time for Christmas. Now we do know from previous experiences that in 6 days a lot can change (Joshua was packed and we were told 12 hours before he was expected to come home that he had 2 stay for another 3 weeks!) but Nathan is definitely on the way home! And next Thursday is of course his 12th birthday – what a fantastic present! Nathan is now doing really well. Incredibly both his adenovirus load has dropped significantly and the ‘violent red’ rash has spread no further and is now fading – praise God! He is well in himself and is now spending a lot of waking time making the nurses, doctors and consultants laugh when they come in his room. He will however definitely be in hospital for his 12th birthday which is next Thursday – 15th December. It would be great of you could inundate him with cards. The Adenovirus is still on board and the load has increased recently. The +ve signs are that his lymphocyte count has risen into the mid 0.2’s – we need it over 0.3 to see the end of this virus. But the GVHD rash is now back on his lower legs – if it spreads significantly then they will use steroids to dampen it down – which will also dampen down the lymphocytes. And Nathan now has a fungal infection in his lungs. The Dr’s do not seem particularly concerned re this as it has been spotted early and is now receiving treatment – but is it giving him some very high temperatures. Indeed because of the temperatures Nathan actually went back to bed today – the first time for a long time. He remains in isolation but is allowed off the ward – suitably wrapped up. So still some way to go – we had hoped that Nathan would have been home for his 12th birthday on the 15th December but this looks unlikely now. And the prospect of a second Christmas with the family divided between GOSH and Romsey is also looming! Nathan is doing very well. The GVHD rash has now all but gone, he continues to absorb his medicines well and the blood gas results suggest that his kidneys have repaired themselves. He still has the adenovirus onboard and this is now what the consultants would like to see go next. He is allowed off the ward for brief times – and so even though we are in the middle of London we have been able to daily visit sheep and goats… Thanks for all your letters, cards and gifts – they are a real boost for him. We now have to deal with having two sons in two separate hospitals – although we have been told that Joshua should be home again shortly. It’s difficult to know where to begin this one. Firstly Nathan remains well in himself, Mr Smiley and enjoying making stuff and watching CBBC and the new Star Wars movie. He is even baking despite being nil by mouth. But there are a number of important conflicting medical issues that need to be resolved quickly before things potentially get very serious. Nathan’s adenovirus load has increased significantly this week but is away from being ‘worrying’ as the consultant put it on ward round this morning. Whilst this is a common virus amongst children, for those that are immune suppressed it can be potentially devastating. Unfortunately the first line of defence drug used to suppress this virus has also damaged his kidneys so they have had to withdraw the drug to allow his kidneys to rest. They are now starting a second drug that should help hold the adenovirus back but without impacting his kidneys. The IV drug that caused the fit a week ago was the main drug used to suppress the emerging graft (and help prevent graft vs. host disease). This was immediately withdrawn and an oral replacement given. Unfortunately Nathan is not as yet absorbing it well enough to give good protection – the level yesterday was 45 out of a required 150. This is probably due to the damage done to the kidneys – which are now being rested and should start absorbing soon… (Quickly please). If you follow all that you will see a potential vicious cycle that we don’t want to head down. It is important to note that Nathan remains well in himself through all this. Over the last 2 years we have tried to live ‘one day at a time’ but sometimes it seems impossible to do this. Yet we have seen sometimes great and sometimes small but significant miracles happen – I guess we need these now for Nathan. On Friday last week Nathan had a fit/seizure. This was very frightening indeed and potentially very serious. The positive news is that he is now fully recovered from it – and indeed remembers nothing of it. There are no signs of any brain damage. After a CT scan, lumber punch and MRI the team looking after Nathan are convinced that it is down to the toxicity of the main immune suppressant drug they were giving him so this has been stopped. This now leaves him open to potentially acute Graft vs. Host Disease which could be very serious indeed. The next 48/72 hours are pretty crucial in terms of seeing whether they can replace the IV version with an oral version of the same drug. Nathan is on other immuno suppressant drugs but this is the main one. Already he has a GVHD rash across most of his torso – which is not in itself serious but a warning of what may come. Amongst all this we received a great CD that was simply entitled ‘peace’ – the timing could not have been better! Please continue to pray for Nathan we need to get over and beyond this. Nathan’s transplant went without a hitch. We are so unbelievably grateful for the wonderful mystery donor who has saved his life – who ever you are we are forever in your debt. He is now 100% donor engrafted and starting to produce some of his own white cells. And strangely any time now his blood group will change as the donor had a different blood type to Nathan… Up to yesterday afternoon he was doing very well with sickness – but he was very sick yesterday afternoon – a real shame as he had been doing so well. I (Ian-family friend) have just had a brief telephone discussion with David and he asked me to post a brief update. Nathan has had his transplant and is doing well and has started the process of recovery. Joshua is improving and it is hoped although still has some way to go before he will be able to return home. Unfortunately Daniel has broken his wrist and now has a lovely red plaster on his arm! Please pray for the family, especially both parents as they are finding it a particularly stressful time. Nathan is doing very well. He has settled well into hospital life and is taking it all in his stride. He has amazed us by quickly making the required 1.5 litres of fluid intake, eating reasonably well and managing his teeth (toothpaste and vile mouth wash – 4 times a day). No sickness to date but we know that it is very early days (day 3 of chemo today). Nathan is doing OK up at GOSH. He has now had his two pre transplant operations and is doing fine. The first was quite painful as they had to stretch his oesophagus to get the probe down – but both were successful. Allison has been with him this week and I go up for my ‘tour of duty’ starting tomorrow. He is due to start his chemotherapy on Monday. A few folks have asked for a photo – particularly with his short hair (none school regulation) – his hair should fall out in about 3 weeks time. head that I had to with Daniel) and is very ‘up for it’. The countdown is very much on for Nathan going in for his bone marrow transplant. We had the final green light last Friday and this Thursday (22nd) I will be accompanying Nathan to GOSH for his PEG (tube that goes straight into his stomach for easy administering medicines, food etc) to go in. And on the 29th we go up to start the pre treatment proper and chemotherapy. The expected date of transplant is Wednesday 12th October. Nathan had a great day at his new secondary school – winning many new friends. And for those who can, we will be featured on BBC Breakfast News this Monday morning – it was recorded yesterday so we don’t know what time! We now have a confirmed date for Nathan to go up to Great Ormond Street Hospital for his transplant – the end of September, just 4 short weeks away. This may move out slightly due to availability of beds. It was sobering again to go through the procedure with the consultant again today – and to be told the % changes of all being well. Nathan remains well and has no fear of the forthcoming transplant. This Sunday both Joshua and Nathan are going ‘Over The Wall’ for a week at a special camp which they are looking forward to. Nathan and Luke remain well – Nathan is now due to go to transplant at the earliest in September. So hopefully he should be able to start his new senior/secondary school at the start of September – if only for a few weeks. Nathan and Luke remain well. And Mum and Dad actually managed their first evening out on their own for well over a year. It was a little strange (but very nice as well). The knock on effect of Daniel being in hospital (see his page) is that it is now unlikely that we will have Daniel well enough for Nathan to go up for his transplant in mid June – so this is likely to be pushed out yet again. Both Nathan and Luke remain well (and EBV free). So the roller coaster ride continues. Nathan is due to go in mid May now for his transplant. Nathan remains well. It is planned at the moment that he will go in for his transplant around the end of April – this may be pushed back. The elves and secret Santa’s went down very well in our household(s). Daniel had a great day at GOSH opening presents and now has more than enough activities to keep him set up before returning home – hopefully in around 2 weeks time. We do have some photos and will send on to the elf’s ‘soon’ – with one parent at GOSH and the other at home we are not the best co-ordinated at the moment. Those of you following our story will be very aware that the 3 most frightening letters for us are E B V… this is the glandular fever virus that the boys have no immunity to – and which can cause death for the boys. A couple of weeks ago Nathan was diagnosed with it – although it was at the lowest level detectable. Last Thursday new bloods were taken again, the day that he was off school ill (first time in 7 years!). So we assumed the worst that the load would be much higher. He is now EBV free. The wonderful medical folks put it down to a ‘blip’ – as Christians we say ‘thank you Jesus’ … (and thank you for those that have prayed for him). Nathan is back at school and seems 100%. We are still awaiting his EBV results and what action they intend to take if any. Nathan unfortunately now has EBV on board. A routine blood test last week picked it up, as there had been no sign of glandular fever. It is at the very lowest level (50,000 load) detectable – but it is on board. Unfortunately he was quite unwell today so had his first day ill off school for 7 years (since his lymphoma). If the symptoms persist he will also go into our local hospital tomorrow (Friday) although he seems well this evening. New bloods have been taken to see if the EBV has progressed and to decide what action is necessary. So, it’s a real battle in the Hartley household at the moment – I think we feel that we can fight one battle at a time but not two or three together … welcome your prayers as always.